The Stratton Setlist – Page 2 – Catch the opener. Stay for the encore. 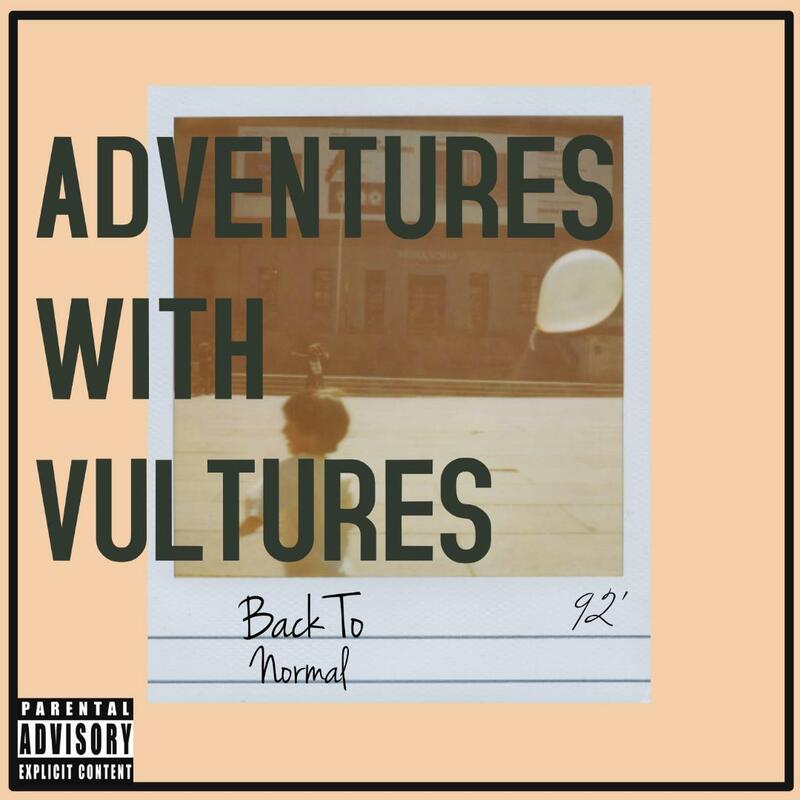 Adventures with Vultures has released their latest single, “Back to Normal,” which features a new alt rock sound. Adventures with Vultures is bringing a new normalcy to acoustic indie folk rock. The Plymouth singer-songwriter, aka Matt Sauter, combines his down-to-earth indie folk rock roots with lush new alt-rock growth on his latest single, “Back to Normal,” which drops today. That live fan favorite also features the talents of Dan Sauter (bass), Jon Staten (drums) and Jimmy Showers (guitar), who now serve as official band members for Adventures with Vultures. He also worked with Jake Rye of Social Recording Company in Adrian to produce and mix the track. Originally, Adventures with Vultures started as an emerging indie folk solo act for Sauter, who released his brilliant, introspective four-song debut EP, “Junction,” in 2017 through Original 1265 Recordings, an independent label owned by CND America, DIME’s parent company. Sauter expanded the project into a full band after playing a growing roster of live dates in Michigan and going on his first national headlining tour last year. He’s also transitioned from being part of Original 1265 Recordings to becoming an independent, do-it-yourself (DIY) artist. As a DIY artist, Sauter recently launched a GoFundMe campaign to help support releasing new music as well as an upcoming tour. To date, he’s raised nearly $2,000, thanks to his burgeoning fan base, and sponsoring additional casino bus and golf outing fundraisers. As a next step, the band will release a new video soon for “Back to Normal” and return to the studio in April to record their next single. Adventures with Vultures also will perform a series of upcoming live shows, including April 13 at The Blind Pig in Ann Arbor with LVRS and Jackamo, April 26 at New Way Bar as part of Ferndale Spring Fever and May 24 at Mac’s Bar in Lansing with Joshua Powell. 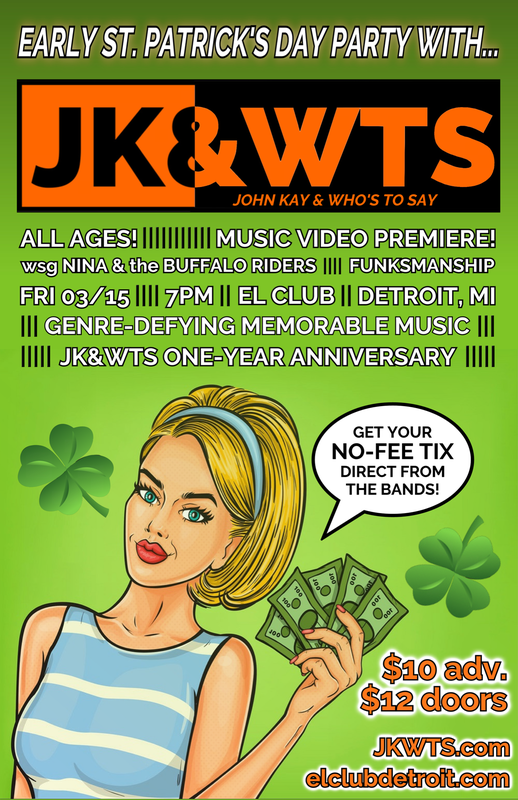 John Kay & Who’s To Say will premiere a new music video Friday night at El Club in Detroit. John Kay & Who’s To Say will premiere a new music video Friday night that spotlights the nation’s lack of gun control. The progressive pop group will debut the video for “Maybe (Armed to the Teeth),” an anti-gun violence anthem for youth and schools, at 9:15 p.m. Friday during their one-year anniversary show at El Club, 4114 Vernor Highway, in Detroit. Kay thought twice about gun violence in schools after hearing about the mass shooting at Marjory Stoneman Douglas High School in Parkland, Fla., last year that killed 17 students. That tragic event quickly inspired Kay to write and release “Maybe (Armed to the Teeth),” an emotionally-charged track that calls for stronger gun control laws. John Kay & Who’s To Say will celebrate their one-year anniversary and include Nina & The Buffalo Riders and Funksmanship as special guests. For the “Maybe (Armed to the Teeth)” video, Kay turned the creative reins over to videographers Joseph S. Quick and Bradford Clark and bandmate Tamara Marla Laflin (synthesizer, vocals, percussion) to develop the overall concept, which features several talented southeast Michigan teens as cast members. The teens featured in the video will attend Friday’s John Kay and Who’s To Say show to celebrate its premiere as well as the band’s one-year anniversary. Last year, Kay teamed up with Steve Lupinksi (bass, vocals), Brandon McNall (lead guitar), Jason Rauschenberger (rhythm guitar, percussion, vocals), Angelo Coppola (drums, vocals) and Laflin to form the band. Together, Kay and his bandmates have been building a strong live music presence in Detroit and throughout the Midwest after performing their first sold-out show at PJ’s Lager House last March. They’ve also performed at Mulligan’s Pub in Grand Rapids, Howard’s Club H in Bowling Green, Ohio, The Elbo Room in Chicago and The Parliament Room at Otus Supply in Ferndale. As the band’s frontman, Kay takes an unconventional approach to leading John Kay & Who’s To Say. He’s identified seven core values known as SMARTER – sacrifice, measurable growth, accountability, a reputation for excellence, time, energy and respect – for the group and teamed up with bandmates who share these values. Kay also launched the band’s official club, Bullfighters, last year through a subscription-based content service called Patreon. For $5 a month, fans receive the band’s music in a digital format, updates and happenings, merchandise discounts, free U.S. shipping and two concert tickets per year to local shows. They also have access to new song demos and are encouraged to provide feedback directly to the band. Local Bullfighters will be attending Friday’s night show, which also will feature songs from Kay’s 2016 album, “Dealing with People,” as well as the band’s latest singles, “We Know We’re Gonna Die” and “Maxin’ Out.” Detroit psychedelic blues rockers Nina & The Buffalo Riders and Motor City funk-psych-jazz fusion quartet Funksmanship will open the show. After Friday’s show, the band will develop a new video for another single and return to the studio to write and record new material. As a follow-up to “Dealing with People,” Kay said the band is focused on releasing a series of new singles and recording more video content for their YouTube channel. Plymouth’s Cold Tone Harvest will headline Friday Night Live at the Farmington Civic Theater on Friday. A Plymouth-based Americana quartet will harvest their homegrown rootsy sound Friday night in Farmington. 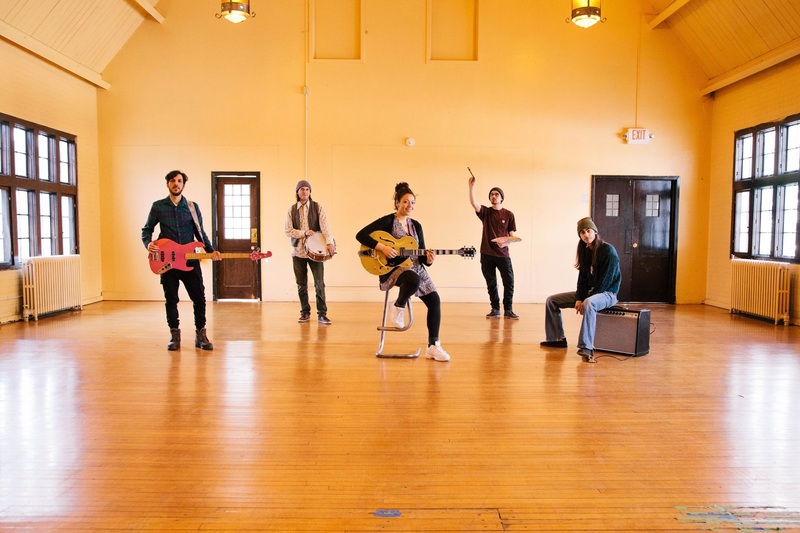 Known as Cold Tone Harvest, the band will join Ypsilanti indie folk singer-songwriter Chris DuPont as part of the intimate “Friday Night Live” concert series at the Farmington Civic Theater, 33332 Grand River Ave. in Farmington, at 8 p.m. Friday. 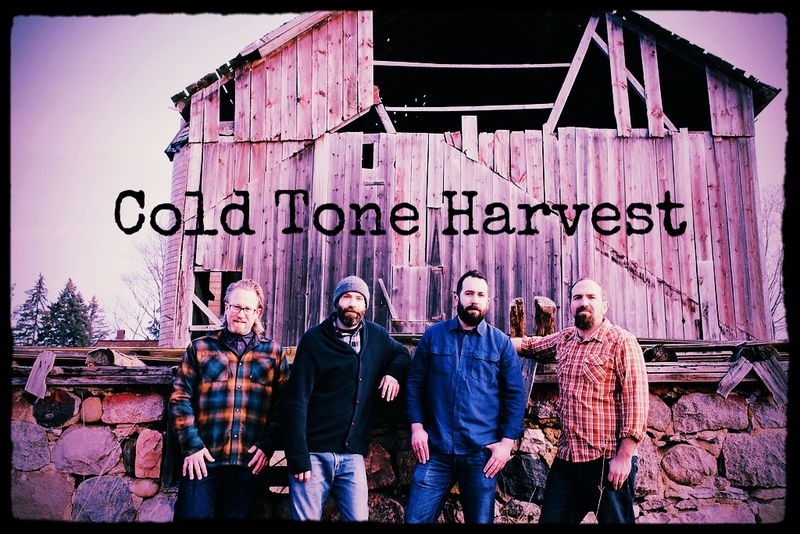 Cold Tone Harvest will perform a headlining set with raw emotional tracks from their latest album, introduce some highly anticipated new tunes and covers and bring DuPont on stage to round out the night. The band also will join DuPont for part of his opening set to add a fresh take on his past, present and future music. “Chris is going to join us on a bunch of our tunes, and then we’re going to support him when he joins us for a couple of his tunes and maybe mix in a little surprise here or there,” said Williams, who originally hails from Plymouth. With their rich country-infused melodies, rhythms and instrumentations, Cold Tone Harvest’s Andrew Sigworth (vocals, acoustic guitar), Ozzie Andrews (acoustic bass, bass guitar, bass banjo), Anthony Pace (electric guitar, lap steel, dobro) and Williams will perform thoughtful, heartfelt tunes that poetically chronicle adversity and creatively demonstrate the inner strength to overcome it. 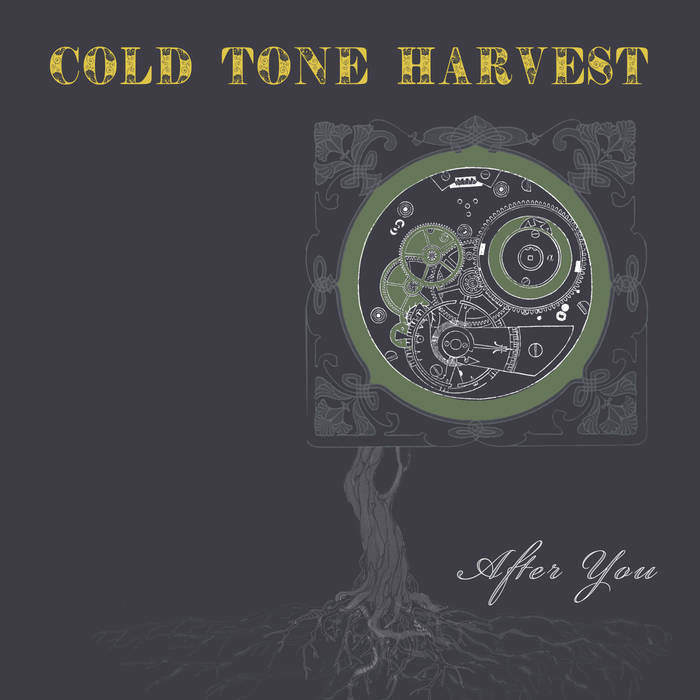 Whiskey songs, personal reflections and heartache anthems summarize Cold Tone Harvest’s magical 2018 debut album, “After You,” which sonically captures the feel of watching a piercing crimson sunset on a crisp autumn evening while freshly fallen leaves crunch beneath one’s feet. Formed in 2008, Cold Tone Harvest originally featured soft-spoken singer-songwriter Sigworth in partnership with Williams. Together, the pair advocated for a sonic landscape built around Sigworth’s voice as a centerpiece against a percussive backdrop. The Late Station will host a special one-year anniversary show tonight in Ypsilanti. A special celebration of Ypsilanti’s emerging do-it-yourself (DIY) music culture will take place tonight at The Late Station. 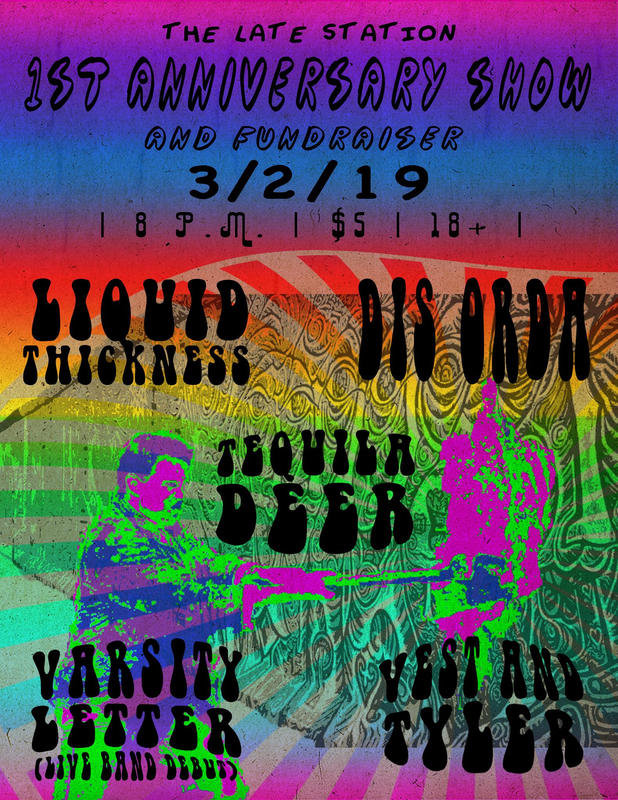 Hosted by After Hours Radio, the 8 p.m. show will commemorate the DIY music venue’s one-year anniversary with a stacked lineup featuring Liquid Thickness, Varsity Letter, Dis Orda, Tequila Deer, and Vest and Tyler. It’s the ultimate mixed genre show filled with funk, acoustic folk punk, hip hop, post-punk, EDM and chiptune. Eclectic lineups are one of The Late Station’s specialties – the venue accurately reflects the diversity of music, sounds, approaches and performance styles coming from one of Michigan’s brightest music scenes. Along with bandmates Nate Erickson (vocals, guitar) and Mark Dunne (drums), Hughes started The Late Station in 2018 after performing at University of Michigan co-op open mic nights as a college student and experiencing the Chicago DIY music scene. To date, After Hours Radio has hosted 24 shows at The Late Station. For each show, bandmates, friends and volunteers help book shows, promote events, run the door and assist with gear. The band also accepts donations from attendees at each show to help fund shows and other venue-related needs. For tonight’s show at The Late Station, After Hours Radio is accepting $5 donations to help pay for venue repairs, including the iconic sign by the stage. Donations can be made through PayPal or at the door. Tonight’s show also allows After Hours Radio fans to embrace the versatile artistry and musicianship of the show’s five special guests. Here’s a quick look at each artist and what they’ll be bringing to tonight’s performance. Spirits of Fire knows how to rekindle a heavy metal flame. The heavy metal supergroup is reigniting fans with the release of their highly combustible self-titled debut album today on Frontiers Music. 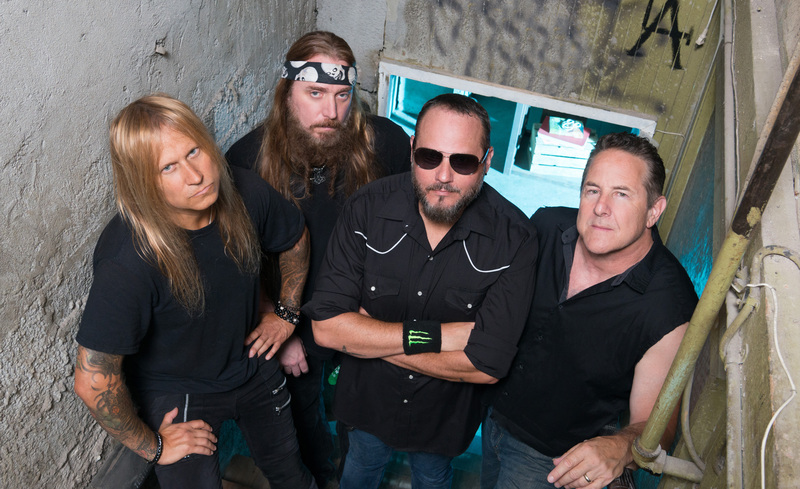 Together, Tim “Ripper” Owens (vocals), Chris Caffery (guitar), Steve DiGiorgio (bass) and Mark Zonder (drums) fuse 11 scorching tracks that blaze an invigorating musical trail heavily influenced by Judas Priest, Savatage, Testament and Fates Warning. “To get a chance to do this record was really special to me, and to work with somebody like Roy Z., who I have always considered to be one of the good, really modern minds of heavy metal, it was just a win-win thing all the way around to have this going and to get a chance to make these songs,” Caffery said. With the help of Frontiers Music, Caffery teamed up with longtime pal Owens and new friends DiGiorgio and Zonder to form Spirits of Fire in August 2016 and recorded their debut album with renowned Los Angeles-based producer Roy Z. “I’d say there was about a year in the writing process before we went into the full recording process of it. Then, just because everybody’s on different schedules, it took about another six months to get everything finished, to get the guitars, bass and vocals and everything done, it was finished completely by the beginning of April 2018,” Caffery said. 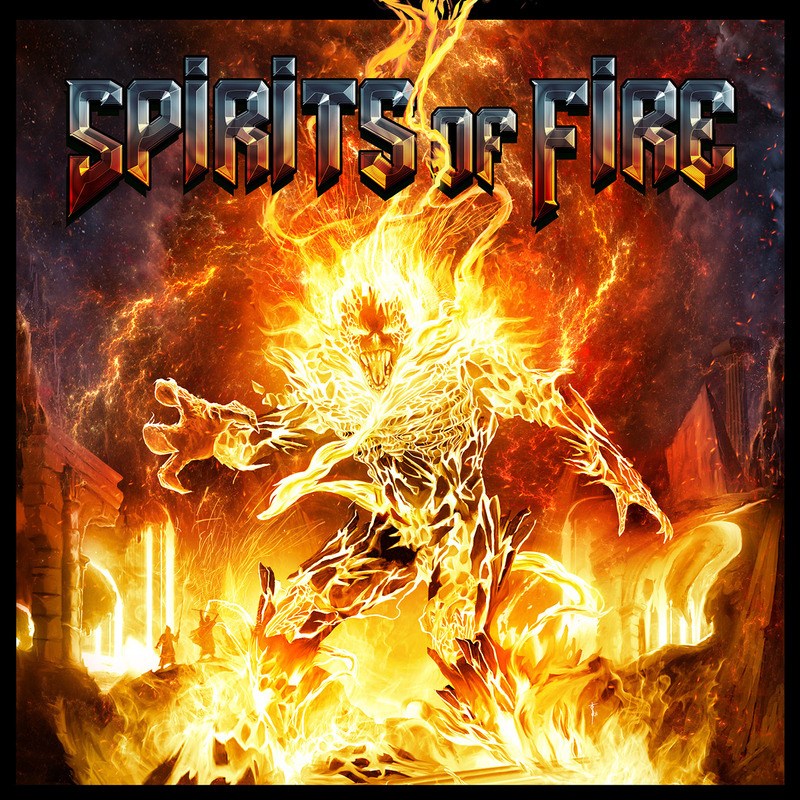 In November, Spirits of Fire released their first single, “Light Speed Marching,” a turbocharged heavy metal anthem featuring electrifying guitar solos, pounding drums and surging bass lines. The band also met in downtown Los Angeles last summer to film the video, which features a fast-paced performance in a hot industrial underground setting. In response to the success of “Light Speed Marching” Spirits of Fire also has released two explosive follow-up singles, the victorious, ready-for-battle masterpiece, “Stand and Fight,” and the personal ode to darkness, “It’s Everywhere,” to spark attention from the heavy metal music community. The band also plans to release a video for “It’s Everywhere” soon. 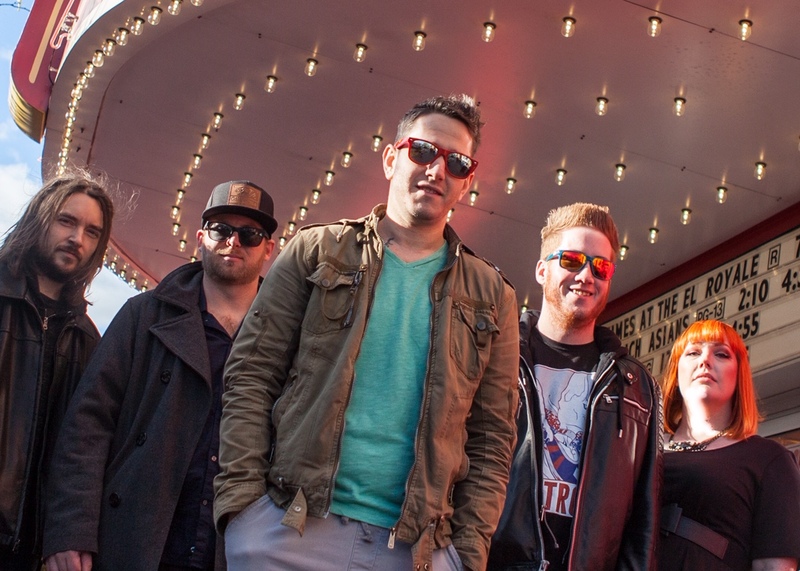 In addition to their three powerhouse singles, Caffery admits the band’s signature and self-titled track, “Spirits of Fire,” best captures the feeling, inspiration and approach behind their music. It beautifully weaves the album’s 11 tracks together and provides an intimate look into the band’s musical soul. Luckily, the band remains in good spirits with the release of their debut album and hopes to play festivals later this year to support it. Honey Monsoon has released a new single, “Cloud,” from their forthcoming album, “Opal Soul,” due out March 22. With a vibrant new single and lineup, Honey Monsoon is floating in a new musical stratosphere. Earlier this week, the metro Detroit jazz-fusion quintet dropped their latest single, “Cloud,” a five-and-a-half-minute peaceful sonic journey filled with funky guitars, bright synths, gentle cymbal crashes and slow grooves. That uplifting musical path soars to the sky-high auditory intersection of jazz, disco, rock, funk, soul and R&B – think Stevie Wonder, Nile Rodgers, George Benson, Sade and Toro y Moi combining their signature styles into an atmospheric sound. Honey Monsoon will release a new video soon for “Cloud” that features footage from some of their local favorite spots in Detroit, including the Fisher Building and the Renaissance Center. Additional footage was shot at a local church in Ypsilanti. 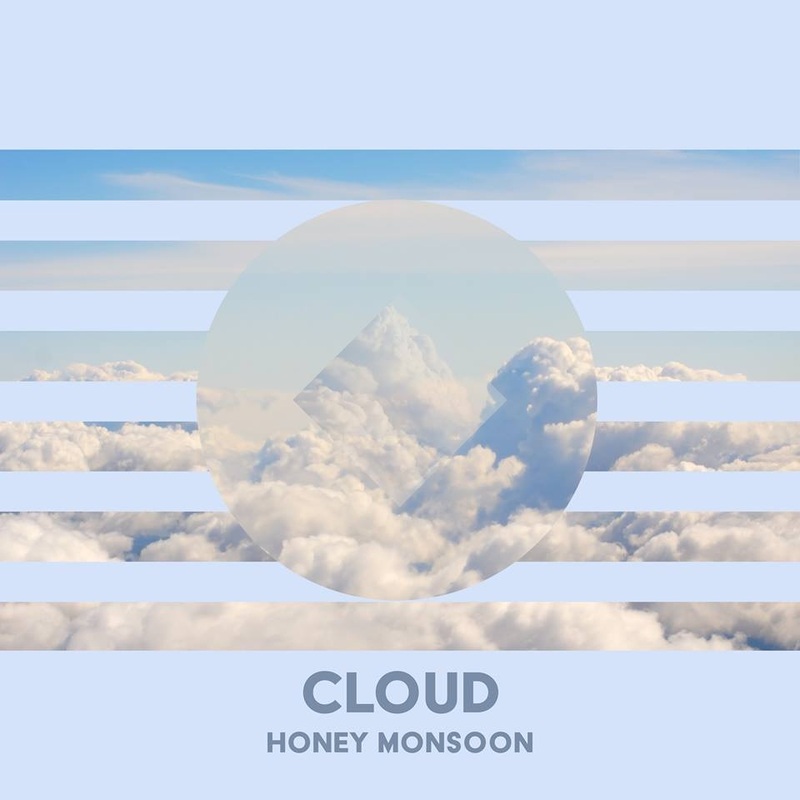 “Cloud” is the first single from Honey Monsoon’s forthcoming album, “Opal Soul,” a follow-up to their 2017 jazzy, soulful debut, “Rose Gold,” due out March 22. It also features a fresh lineup with new members Sam Naples (guitar, vocals) and Binho “Alex” Manenti (bass, keys) along with Taylor Greenshields (drums), Leo Willer (paintbrushes) and Gomulka. Produced, engineered and mixed by Greenshields and Naples at Fundamental Sound Co., “Opal Soul” will feature eight tracks and include former member Andrea Holther-Cruz on two to three songs written with the previous band’s lineup. “Opal Soul” also will feature a more diverse sound that draws influences from pop, rock, Latin, funk, Afrobeat and world music. For “Rose Gold,” Honey Monsoon intertwined jazzy, soulful sonic textures against a rock-infused backdrop with bright vocals and saxophone solos. Honey Monsoon will celebrate the album’s release with a special show March 22 at The Loving Touch in Ferndale with Kesswa, White Bee and Sara Marie Barron. “We’re excited to share our new organic sound, feel out the space and celebrate the moment with everyone,” Naples said. 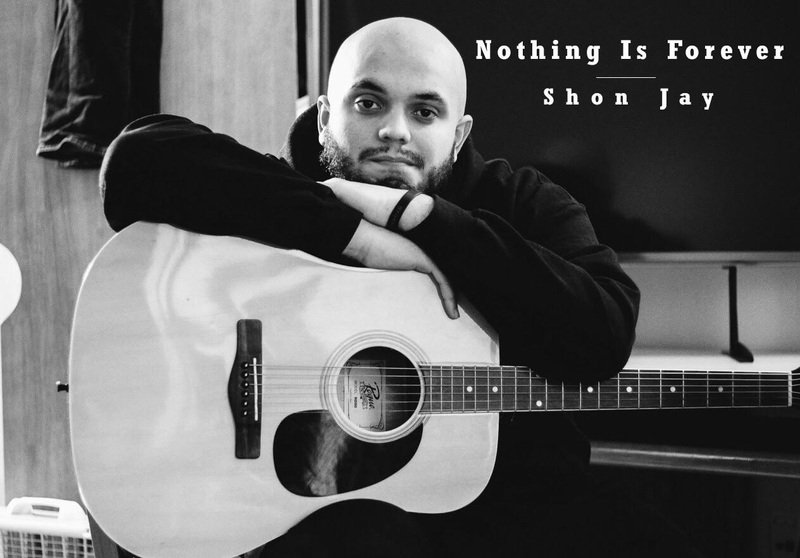 Shon Jay drops his debut EP, “Nothing Is Forever,” today on major streaming sites. Shon Jay knows how to create a groove-fueled musical time machine. 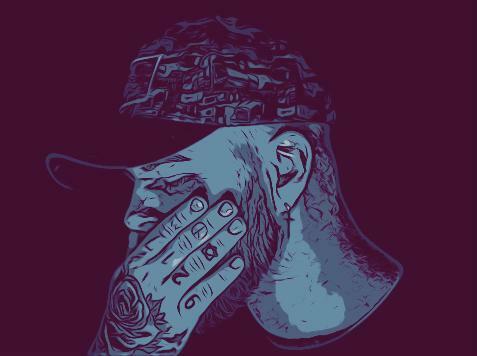 The Southfield indie artist mixes retro R&B with current pop-inspired textures on “Nothing Is Forever,” his eight-track debut EP that drops today. He magically transports listeners to a personal sonic world that fuses late ‘70s, early ‘80s vibes with catchy 21st century melodies. Jay, aka Shon Johnson, teamed with his father Lamont Johnson, a renown electric bassist from the Detroit-based funk group Brainstorm and a solo artist, to record and produce the beautifully crafted EP. Jay and Lamont Johnson recorded “Nothing Is Forever” from September to December with Todd Johnson at Throne Muzik in Southfield. Together, they weave a powerful relationship theme throughout the Lamont Johnson-penned project – it exquisitely captures the rollercoaster of emotion with falling in love, becoming a couple, drifting apart, breaking up and moving forward. The EP’s latest single, “Dreamin’,” includes a laid-back Earth, Wind & Fire feel surrounded by soul grooves, electronic finger snaps and gleaming synths. “It has such a mellow mood, and it has ups and downs in terms of delivery for the notes and the melody. It’s very intricate and smooth. To do both, I would say that was the most challenging song to record because of how all over the place it is with intonations,” Jay said.